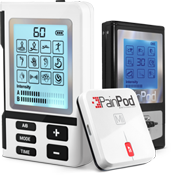 PainPod™ proprietary physical therapy technology. New gentle Face Massage mode to promote circulation. Dual port technology - use 4 pads with 2 different modes at once.